The visitors made it through to stumps on the third day on 182 for six - a mammoth 322 runs short of their victory target - but they know only a major downpour or miraculous rearguard action will save them from a third defeat of the summer. Sam Northeast's side predictably batted through until mid-afternoon to reach 298 for two in their second innings for an overall lead of 502, before bagging four Sussex wickets through to tea. Harry Finch was pinned lbw by the fiery Matt Coles, who then clung on to a return catch that sent Luke Wells packing for no score. Darren Stevens claimed his sixth wicket of the match by bowling Chris Nash and, at eight for three, Sussex were seemingly hell-bent on defeat. Visiting skipper Luke Wright restored some pride with 38 off 32 balls before his attempted pull shot against James Harris took an inside edge through to Kent keeper Adam Rouse. Kent snagged two more after the interval through occasional leg-spinner and man-of the-match Joe Denly. Fresh from scoring 119 and an unbeaten 71, Denly had Stiaan van Zyl caught behind chasing a wide one and, two runs on, held on to an ankle-high return catch that accounted for Chris Jordan. 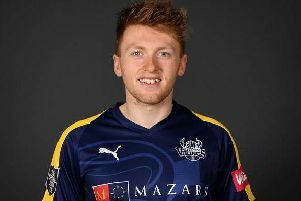 Understudy keeper Michael Burgess dug in for 44 in tandem with David Wiese to see Sussex through to the close, but unbeaten Kent remain favourites to land their fourth win in five starts.